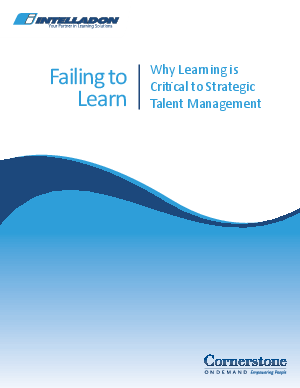 In this paper, Failing to Learn: Why Learning is Critical to Strategic Talent Management, we will discuss five areas of talent management, demonstrate how absence of a learning component can hold an organization back, and show how an organization can benefit from seamlessly integrating learning management with its talent management processes. Many organizations, regardless of size or industry, are turning to talent management technology solutions to achieve a significant business impact. Research has shown that companies with intermediate to advanced levels of talent management performed better financially during the recession as well as generated higher revenue per employee and lower overall voluntary turnover. With this in mind, it is not surprising that organizations are turning to talent management and integrated suites of solutions. The irony is that most talent management solutions are missing the one critical component that will make that business impact a reality - learning. A CedarCrestone HR Systems Survey showed that the learning management application in any combination with other talent management applications is linked to the strongest revenue growth. However, too many businesses make the mistake of selecting talent management solutions that offer few, if any, learning capabilities; or worse still, they try to "cobble together" various learning solutions with their other talent platforms. Failing to have learning management as an essential part of talent management is a critical misstep to avoid. However, many organizations don't understand how learning management can make the difference between an efficient tactical process and true strategic HR.